The annual B. 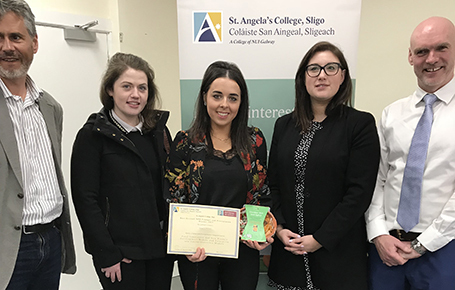 Applied 4 Science in Nutrition, Food and Business Management, New Product Development (NPD)presentations took place on Monday March 25th. Students displayed a wealth of innovation and wowed judges Dragons Den style with their products and market knowledge. The four judges in attendance were Mr. Sean Gilbride (Senior Food Scientist & Technologist Specialist, St Angela’s Food Technology Centre), Mr. Neil Ferguson (Blackstone Launchpad, NUIG), Ms. Aoife Noonan (Quality Assurance Dept. Manager, Lidl Ireland & N. Ireland) and Ms. Michelle Coyle (Quality Assurance co-ordinator, Lidl Ireland & N. Ireland). The students have been working tirelessly on their products since September (2018) where they were asked to create a novel product that meets consumer’s needs, matches food trends and above all else a product that is organoleptically pleasing. Students exceeded all expectations and produced a wide assortment of products that ranged from gluten free and vegan pasta products to the use of crickets in the creation of a high protein bar. Kefir (a probiotic) featured amongst two student’s products, meeting rising consumer demands for more gut health products. Katie Killian won the overall award for Katie’s Kitchen, C’luckin Hot and Spicy. C’luckin Hot and Spicy is an Irish Chicken Gluten free Spice Bag convenience meal in a bowl. The convenience meal comes complete with a Sweet and Sour sauce, providing 332 calories in total. C’luckin Hot and Spicy was high in protein and low in fat. The judges were impressed with the flavour of Katie’s dish and particularly with the texture and flavour of the Gluten free crumb. The judges were equally impressed with the provenance of Katie’s product. Katie who hails from a strong agricultural background wanted to champion and pay homage to Irish chicken that is produced to such high standards. Katie undertook research and her findings revealed that Irish consumers are health conscious, require hyper convenient meals that support the environment and are locally produced. Katie’s product fulfils these demands and Katie’s passion for Irish food was exhibited with ease, which again impressed the judges. Jade McLoughlin and Edel McEniff also received highly commended awards. The judges praised Jade for her level of risk taking and innovation by producing a high protein chocolate bar using cricket flour. Jade’s product is well positioned to meet changing consumer and regulatory requirements for more sustainable food production and meets current trends for high protein products. The judges also commended Edel McEniff for her packaging and marketing for her vegan marshmallows “Atlantic Dreams”. Edel used Irish Atlantic seaweed as a setting alternative to produce light and fluffy vegan marshmallows. 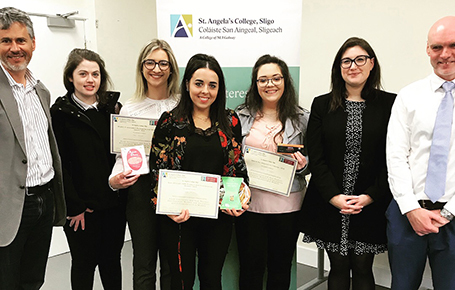 Lecturer Breda O’ Mahony commended the students for the commitment and endeavour they exhibited over the past few months. Breda explained that the presentation encourages innovation and tasks students with bringing a product from conception right through to commercialisation stage. 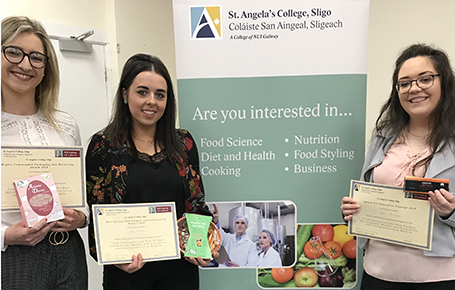 Students integrate their four years of study by conducting sensory trials, market research and applying principles from across modules such as nutrition, food legislation and microbiology. Left to right- Edel McEniff highly commended for her packaging and marketing, in the middle overall winner Katie Killian, Jade McLoughlin commended on innovative concept.